Instructions SENYE retractable belt can stretch to 16 feet, you just press the middle button to automatically stop the belt stretch, and then slide another button to lock the belt, keep a length you need. Slide the button forward to restore the belt. Parameters Color: Black、red Adjustable length:16ft Rope Diameter: 0.6 inches Dimension: 7.2 x 5.4 x 1.4 inches (L x W x T) Warning Make sure that all parts of the leash and your dog's collar are in good condition. If any part of the leash or your dog's collar is damaged, frayed or broken, please do not use the leash. Never try to open the plastic casing, disassemble any other parts, the spring inside may cause unexpected injuries. For safety reasons, keeps your dog at your side before any possible dangerous situation emerges. 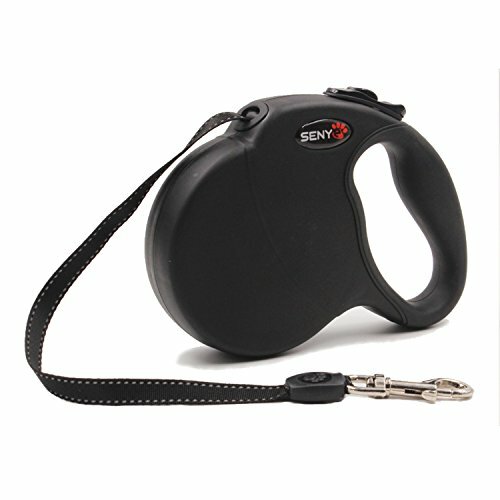 Retractable Leash up to 16Ft: SENYE retractable traction rope can be extended to 16 Ft, giving the dog enough room for activity. One Button Brake Brake and Lock Safety System: Reliable lock button can adjust the length of the belt as needed, the belt can be kept constant, you can absolutely control your dog and your own distance. Comfortable Handle: Ergonomic TPE anti-skid handles are easy to grip, even if your dog is pulling and running without worrying about damage your hand. Heavy Duty: The traction rope is suitable for large dogs, medium and smaller dogs, giving them maximum freedom under security control. To ensure that the product is in good condition. If any part of the damage, please do not use this product, so as to avoid danger. If you have any questions about this product by SENYE PET, contact us by completing and submitting the form below. If you are looking for a specif part number, please include it with your message.